A logarithmic equation can be solved using the properties of logarithms along with its inverse relationship with exponentials. (you may need to use the properties of logarithms to create one logarithmic term). (where a > 0, a ≠1, and logax is defined). y = ln x are inverse functions. • Remember that ex and ln x are inverse function (one undoes the other). • Apply composition of inverses and solve. • Choose base 5 to correspond with the log base of 5. • Isolate the ln expression first. • You will need to use the log properties to express the two terms on the left as a single term. • Remember that log of a negative value is not a real number and is not considered a solution. Using your graphing calculator, solve for x to the nearest hundredth. Method 2: Place the left side of the equation into Y1 and the right side into Y2. 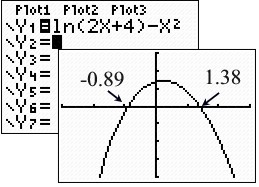 Under the CALC menu, use #5 Intersect to find where the two graphs intersect. Method 1: Rewrite so the equation equals 0. Both values are solutions, since both values allow for the ln of a positive value.